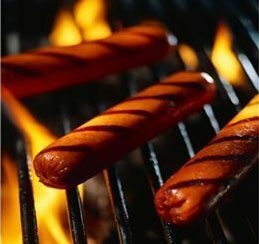 Tuesday Tips: Hurrah - the sun is here at last, but can you persuade your kids to eat the healthy BBQ food? Tuesday Tips: Hurrah – the sun is here at last, but can you persuade your kids to eat the healthy BBQ food? It looks like summer has begun! But as this is England, we need to make the most of it; who knows what it could be doing tomorrow. Well, I have taken it on faith that this is it – so there is no going back. Last night I packed the last of the scarfs and gloves away; those that I could find anyway. Like Terry Pratchet and the sock fairy, who is, if I remember rightly, responsible for all those odd socks, there must be a glove pinching fairy. And in this house, she is definitely a girl; or perhaps my daughter just has more gloves to mislay! So now we must have a good tidy of bedrooms including under the beds to try and reunite those who are lost. With blue skies and temperatures rising, we have retrieved shorts and T-shirts from the loft, drawers under beds and tops of wardrobes. Summer clothes have been tried on amidst protests, despite the reasoning that maybe you might need some new stuff. Result; job done and another bag for passing on or charity. Hubby put the BBQ together – painlessly and seamlessly and we all prepared for the first of the season whilst supping on a Pimms, again the first of summer (well that was the adults). Despite the cries of hunger and how long will it take, we persevered. Even persuading the 3 that salad isn’t altogether disgusting and they should at least all try some. It can take ten tries of a new food for a child to like it and the French supposedly don’t have fussy eaters; they insist their children try everything. Don’t make a big deal if they don’t like it and just say oh well maybe next time. I wonder if the neighbours did too, or was it a bit noisy for them? We also had a childhood favourite; chocolate bananas – you know the ones spilt stuffed with chocolate wrapped in foil and cooked. A fab way to ensure fruit eating! Oh and a word of warning, check where the smoke is going – our room had a new fragrance with slight hint of bonfire! We remembered to shut the windows only part way through. So here’s to summer at least for this weekend; more Pimms anyone?